The Stylist Den: Time for a Pitstop! Preview! Here she is my beloved! As you may already know, Penelope is part of my previous '70 inspired moodboard. But the more I look at her the more I fall in love with her charm, elegance and beauty. Not only she can be always glamourous, no matter what she does, but she's also self-confident and fun! So I decided to style a model after Miss Pitstop and create a Penelope outfit with looklet.com. Check out the preview and two videos featuring her. The full outfit is coming soon. Enjoy and ...FIGHTING!!! Ecco qui la mia amata! 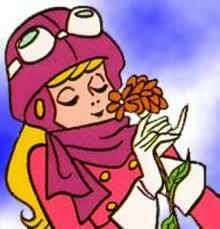 Come forse saprete, Penelope Pitstop fa parte del mio moodboard anni '70. http://dbstyle-thestylist.blogspot.com/2011/01/so-70-moodboard.html . Ma più la guardo e più mi innamoro del suo fascino, della sua elegnaza e bellezza. Non solo sa sempre essere glamour ed impeccabile ma è anche una donna sicura di sè e divertente. Quindi ho deciso di vestire una modella come Miss Pitstop e creare un Penelope outfit su looklet.com. Guardate la preview e due video che la vedono protagonista. L'outfit intero lo postero' a breve. Enjoy e ...FIGHTING!! !